Among the many comments I have read and received on the ‘death’ of Gaddafi, the most often repeated goes something like this: ‘Gaddafi was a brutal dictator and deserved what he got’. The widely-held belief (at least in Western nations) that Gaddafi was a ‘brutal dictator’ is the result of over 30 years of (primarily) US, British and French propaganda against the former Libyan leader. The reasons for this long-running propaganda campaign are many, but chief among them is the fact that Gaddafi was not only fiercely independent as regards his native land, but he persistently sought to bring financial independence to other African nations. The maintenance of a democratic facade while pursuing undemocratic ‘interests’ is today only possible with the committed and almost unanimous connivance of the mainstream media, which unfailingly disseminates government propaganda to the people, which the people accept as truth in the belief that the press is free and independent of government control. But virtually all Western mainstream media outlets today are owned by a handful of powerful corporations and mega-wealthy individuals who count high level members of Western governments as their close friends and confidants. The truth of this can be easily verified by anyone with a computer and a little time to do a little research of their own. The extent of the actual freedom of the ‘free press’ can also be ascertained by revisiting the way in which the Western media blindly accepted and reported as truth, government lies prior to and after the invasion of Iraq in 2003. It is reasonable then to conclude that the Western media, by and large, acts as a ‘Ministry of propaganda’ for Western governments, especially in situations where government(s) are pursuing policies that are at variance with democratic ideals. Throughout most of Gaddafi’s rule, Libyan citizens enjoyed free health care, free education, and free electricity and water. Car purchases for every citizen were 50% subsidized by the government. Gas in Gaddafi’s Libya was $0.14 per liter. Under this ‘brutal dictator’, the mother of every child born received $5000. All these, and many other social benefits under Gaddafi make the supposedly socialist systems of France and other European nations look more like rampant capitalists. Today, with Gaddafi gone, all these generous social benefits are under serious threat from the new pro-Western puppet regime. Gaddafi had invested heavily and generously to the tune of $6 billion in many other African nations. Throughout Africa, hospitals, schools, hotels and roads bear the Gaddafi name as a sign of gratitude to the ‘brutal dictator’. Libyan investments have helped to connect most of Africa by telephone, television, radio broadcasting etc. Many major African companies, in which Gaddafi had invested via the Libya Arab Africa Investment Portfolio, now face financial ruin as Libyan oil money is diverted to the West under Libya’s new rulers. 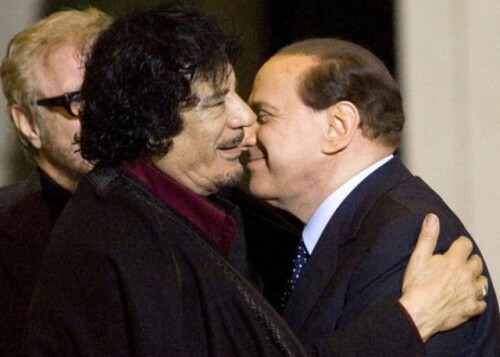 But undoubtedly the greatest threat posed by Gaddafi to NATO warmongers was his efforts to fast-track the creation of an African Monetary Fund and an African Central Bank and to establish the gold dinar as a pan African currency (Libya has 144 tons of gold with a population of jut 6 million, no external debt and $150 billion in cash reserves). Gaddafi’s idea was that African and Muslim nations would join together to create this new currency and use it to purchase oil and other resources to the exclusion of the dollar and other currencies. While a Russia Today report called it “an idea that would shift the economic balance of the world”, Gaddafi’s plans for a radical financial overhaul of African economies would undoubtedly have sounded the death knell for IMF looting of African economies, not to mention the ‘CFA Franc’, a colonial currency tied to the Euro and used in twelve formerly French-ruled African countries (hence the unusual enthusiasm with which the French joined the fray). The late African freedom fighter, Kwame Ture, referred to Qaddafi as ‘a diamond in a cesspool of African misleaders’. Writing in September in the Guardian, Julian Borger & Terry Macalister point out that Western oil companies had planned to carve up Libyan oil before the so-called ‘revolution’. Are we surprised? 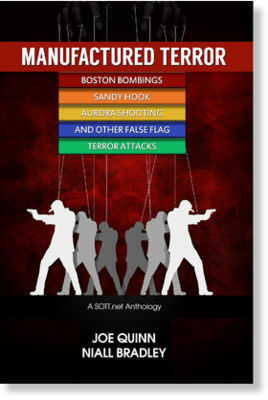 Is it mere coincidence that the NATO bombing campaign began on the 8th anniversary of the invasion of Iraq?The Egyptian uprising was more or less legitimate based on the psychopathic policies of a real ‘brutal dictator’ – Hosni Mubarak – who had brought millions of Egyptians to the brink of starvation, and take note how Mubarak was dealt with in comparison to Gaddafi. But no such conditions existed in socialist Libya. The simple fact is that there was no widespread popular revolution against Gaddafi, there were only ever hired mercenaries, a well-organised Western media, and NATO bombs. See here for more ‘crowd’ pictures. It should come as no surprise then to realise that allegations of ‘war crimes’ leveled at pro-Gaddafi forces and that Gaddafi ‘bombed his own people’ during the NATO bombing campaign were simply a continuation of the decades-long demonisation of the Libyan Leader, and designed to cover up the fact that it was NATO bombs that took the lives of thousands of Libyan civilians. 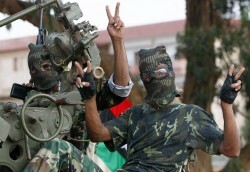 During a bombing raid on 30 April the Gaddafi’s son Saif el-Arab, 29, as well as three of his grandchildren were killed. The four-month-old daughter of Gaddafi’s daughter Aisha was one of those who died. The British media’s bias and mendacity was further exposed in September when it was revealed that a major network had used CGI video from a violent computer game and passed it off as real video footage in an effort to tie Gaddafi to the IRA. 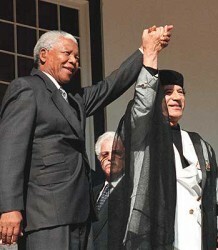 Was it really Col. Muammar Gaddafi that was dragged out of that ‘rat hole’? 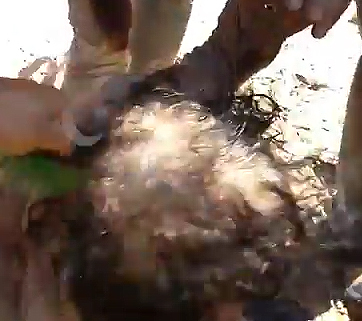 I have already analysed some of the video evidence and drawn a tentative conclusion that the bloodied individual in the ‘Gaddafi capture’ videos is no Gaddafi. Just for the record, here’s a little more. 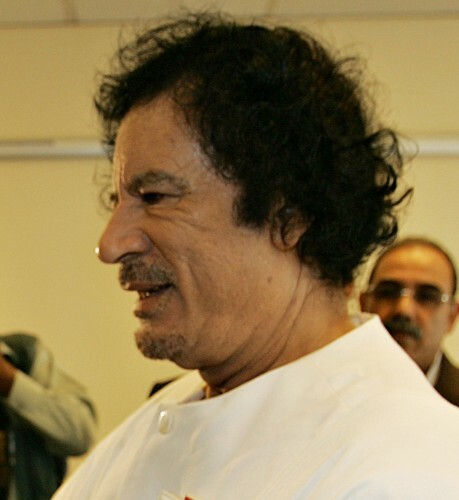 In public appearances over the past few years, Gaddafi appeared with a respectable head of hair for a man his age. Granted, in the first images of Gaddafi above, he could well be wearing a wig or hair-piece, but in that case, why, when identity-verification tests were conducted at a Libyan hospital on the man they pulled from the ‘rat-hole’, did Libyan officials state that the ‘rat-hole’ Gaddafi was wearing a wig because the hair on his head was not Moammar Gaddafi’s? The fact of the matter is that people like Gaddafi do not remain President of a major nation for 40+ years without having self-preservation high on their list of priorities. The idea that Gaddafi would have waited until he was dragged from a sewer by a gang of bloodthirsty hoodlums and then beaten and shot dead is stretching his reputation as a true ‘man of the people ‘ a little far. Gaddafi’s 40 years of watching the workings of Western diplomacy (aka treachery), both up close and personal and from afar (Iraq), would have left him in doubt what lay in store for him if regime change ever came to Libya. He would also have been egotistical enough to realise that he would be of better service to his beloved Libya alive than dead. The rational conclusion then is that, like Saddam Hussein, Gaddafi left Libya long before he was forced to resort to a sewer with only his golden gun between him and a baying mob of paid killers. As with the case of Saddam, there is evidence that this is what happened. It is always useful to consult media reports that were released early on in any major news item such as a NATO invasion of a sovereign nation. In February 21st report, the British Foreign Secretary, William Hague, was quoted as having said that Gaddafi had already left the country. The report quoted a Libyan military council source as saying that troops loyal to Gaddafi’s regime accompanied the convoy to the border. See my article on the Capture, Trial and Conviction of Saddam Hussein for evidence that Saddam too was spirited out of the country long before someone that looked like him was pulled from a ‘rat hole’. In making this statement, Clegg has departed from the British government’s original rationale for an attack on Libya – humanitarian intervention – and has made clear the real reason for the 8 month-long bombing of Libya, its people, and their freedoms – naked, bloody imperialism, launched, quite coincidentally, on the 8th anniversary of the illegal invasion of Iraq in 2003. The west brutally invaded Libya because Gaddafi wanted to trade oil for gold, not because he was a bad leader. I completely agree with you on that one. The west should be ashamed. 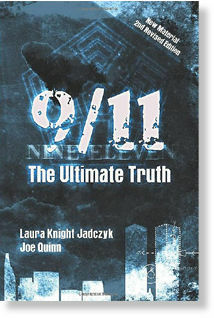 Osama bin Laden however, died in december 2001. His 'media'-death was completely faked, and they did a lousy job.